Less than a year after J.P Morgan bought 130 acres of riverfront property from the ransacked Harmony Society, his new conglomerate – the American Bridge Company went into operation. 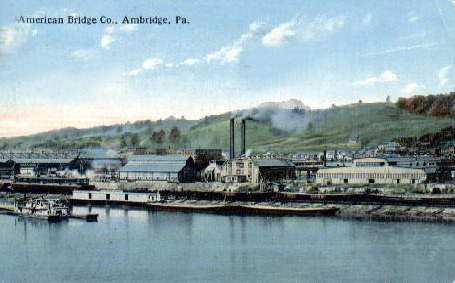 Opening in 1903, the company set out to distinguish Ambridge from older steelmaking communities by promising it would be “smokeless”—inviting only manufacturers that shaped and assembled the steel made in dirtier precincts around Pittsburgh. The company put out a call for workers, and they flocked in from the rural South, Europe, Canada and Mexico. The incoming immigrants who passed Economy’s outlying orchards and vineyards looked upon the German enclave at the northwest corner of town with awe, inspired that they, too, could build heaven on Earth in this land. And what was true in 1804 would be true in 1904: the new arrivals invested their own vision of Utopia in powerful men who courted their belief. The Bridge Company’s real estate arm, Liberty Land Corporation, laid out a prototypical company town. After completing the American Bridge office building—a brick monstrosity where my father worked as a draftsman for thirty years—the company laid out a leafy park that ran beside the river. Along the park, American Bridge built spacious houses for its executives. One block back sat smaller houses for foremen and supervisors. Farther back were row houses for laborers. Construction hit a feverish pitch, matching the company’s instant success. Demand for bridges and buildings climbed every day, and American Bridge trained its laborers and steelworkers to fabricate segments of structures that could be loaded on rail lines and barges. The company made its own barges to transport its finished pieces. But the rush into operation demanded that Liberty Land throw up tenements for new workers. At the southernmost edge of town, nearest the Bridge Company, these four-story structures soon overflowed with immigrants, most of them Greeks. First Street stood as the counterpoint to idyllic Economy, thirteen blocks north. The crush of humanity situated on First Street, its chaos and nascence, made it seem like a world away, yet it thrived with the same determination the Harmonists possessed when they arrived. For decades, this avenue of tenements held its distinction as the town’s oldest ghetto, the place most workers wanted to leave as soon as possible. 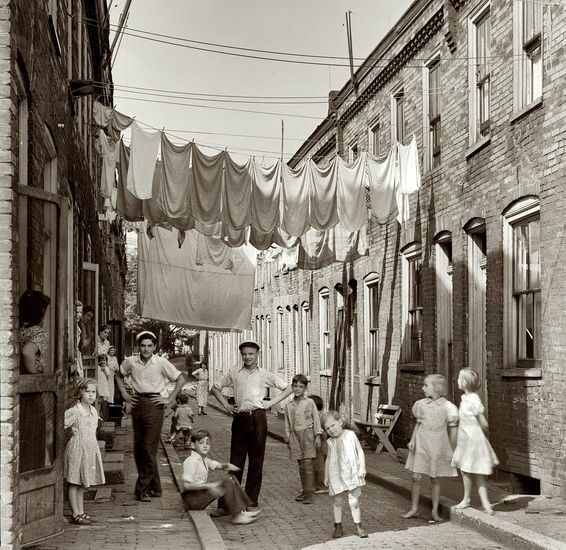 Some striking scenes of life on First Street hang in museums throughout the country, captured by noted Works Progress Administration photographer, Arthur Rothstein. Residents of the lower numbered streets of town could reach the mill within minutes on foot. New factories followed closely behind the Bridge company — H.K. Porter Locomotive Company, National Metal Molding Company (eventually, National Electric) and The Central Tube Company, makers of pipe for transporting oil. 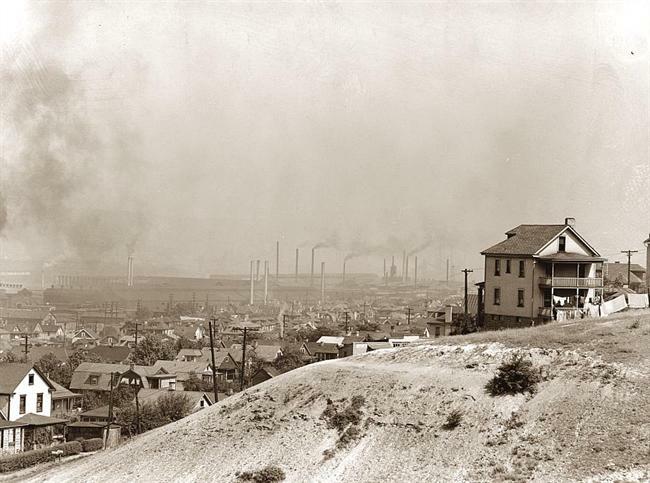 It was hard to imagine a more hospitable place for heavy industry – with oil and gas wells operating on the site and hopeful laborers lining up at the gates. At Economy’s peak in the 1850s, roughly 900 residents lived there under the care of the Harmony Society. By 1900, their numbers had fallen to 620. 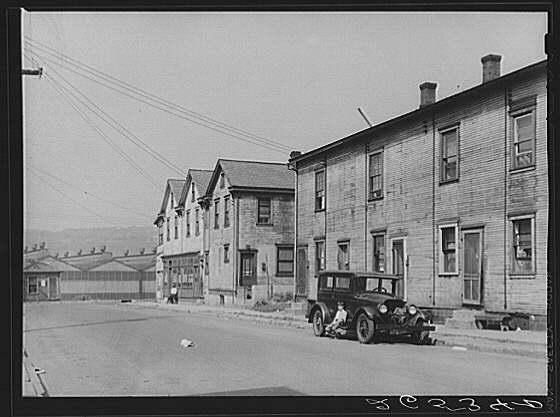 Once the industries and speculators got going, the population of Ambridge shot to 5,205 by 1910. More houses were built as the new immigrants poured in and staked themselves by mortgage, credit, new babies, and old-fashioned loyalty to their employers. They established toeholds, and later brought in their families, friends, and their fellow countrymen. Several families lived under one roof until each could buy a house of their own, often within sight of one another. Ethnic islands formed and churches grew in their midst. Ten new congregations formed before 1910—Baptists, Jews, Protestants, Roman Catholics and Greek Orthodox. Soon, Ambridge became notable for the density of its churches and bars. By 1920, the population more than doubled, to 12,730. The gentle hills that once shimmered with barley and wheat, the smart orchards of the Harmonists, were stripped and decked with massive brick and metal factories, smokestacks and gantry cranes. 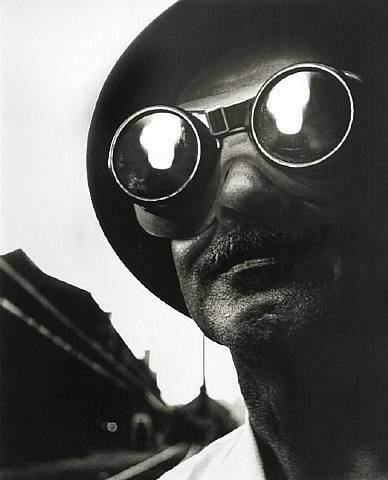 Forges and sheet metal plants, more makers of pipe and rails and machinery snapped up inexpensive land. Their loading docks and railroad sidings formed tributaries that snaked toward the river where barges and freight trains carried away megatons of metal. American Bridge for fabrication. The two companies finished the Woodlawn Bridge in December of 1927, allowing the communities to draw on each other’s labor pool by making the crossing over the Ohio River a five-minute walk. I could see all of the American Bridge Company and more from my grandfather’s lap when we sat on porch of their house above Third Street, high enough to survey the entire town, the river and J&L. We could see the Bridge Company office building and hear the whistles that marked the shift changes. The noon whistle meant my father would soon arrive for lunch. The house behind my grandparents'... so much for "smokeless"
Milt maintained independence from his parents by packing his own sandwiches, and yet nearly every day, he joined them for lunch in their kitchen. On summer days, we sat on the porch afterwards, and could see our parish church down the hill below us, the parochial school he and my mother had attended and I would attend, too. All of it lay at our feet. Our relatives, our spiritual and social center, our source of livelihood and our school could be reached within minutes. Beneath the gray sky-lit roofs of the Bridge Company, men and women cast millions of rivets, bolts, fittings and specialized pieces of steel. They rode crane hooks and beams that hovered into place while catching red-hot rivets tossed from furnaces on the ground, placing them into holes that matched beam to beam. With gloved hands and tongs they held the rivets while co-workers hammered them into solid connections. Others stood beneath showers of sparks, welding heavy plates into position, plumes of acrid smoke rising around them. Ear-splitting collisions rang through the shipping bays and joined the metallic cacophony that filled the valley. My father spent his days bent over vellum sheets filled with drawings that showed how the beams and plates fit together, with precise measurements, the rivet placement and the thickness of the steel. He worked side-by-side with other draftsmen, all former soldiers and sailors like him, who had served time in the mills or bypassed them, taking their math and drawing skills into the American Bridge drafting rooms. They were organized in “squads” and sat behind tall oak tables in a vast pea-green room, illuminated by long lines of humming fluorescent lights. My father constantly worried over accuracy and the potential expense of his mistakes. Squad bosses circulated among the tables, cracking the whip, in a way, pushing the men to draw, figure, and double-check faster. Sheet by sheet, piece by piece, they detailed the Verrazano Narrows Bridge, the Sears Tower and the Astrodome. During its eighty-three years in Ambridge, American Bridge fabricated the Empire State Building, the Chrysler Building and the Woolworth Building in Manhattan, the Hancock Towers in Chicago and Boston, the San Francisco Bay Bridge and thousands of other bridges and structures. During WWII, they built 5,000 troop-landing barges and 120 tank-transport ships. Each one splashed into the Ohio River amid fanfare and prayers that it would help win the war. Milt’s father’s family landed in Baltimore from Hungary. They were typical of the millions whose crossings from Europe were undocumented. 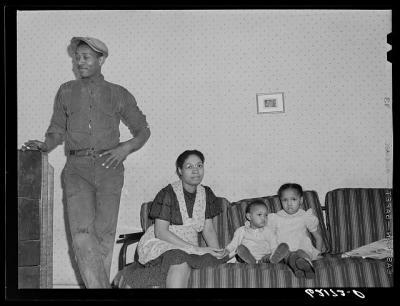 My great-grandparents and their children settled into a crowded triple-decker in rural West Virginia where my grandfather entered the coal mines at age twelve. My research indicates that they came from a village in the Carpathian Mountains, called Hertnik. Many villagers fled to the United States and kept their names, but my great-grandparents, perhaps because they arrived on a boat full of Ukrainians, were assigned the approximate name of their village, plus a “Y” on the end, to give them kinship with all the other souls standing in line. He found safer work that would take only two of his fingers in thirty years, as a die-maker at National Electric – an essential wartime job that kept him off the battlefields of Europe. He soon found jobs at the plant for his six brothers and sisters and the family reunited in Ambridge. His bride, whose family had come to Pittsburgh from Czechoslovakia, joined him, his parents and his siblings in an apartment on Sixth and Melrose. Like most new arrivals in Ambridge, my father’s family quickly found their European countrymen. They joined the Slovak-speaking congregation at Divine Redeemer and kept their Hungarian-Gypsy roots to themselves. The best, cleanest, and safest jobs went to immigrants from Anglo-Saxon countries like Scotland and Ireland, because they spoke English to the owners and supervisors. The worst, most dangerous jobs were given to those who could not be understood: Italians, Greeks, Slavs — Slovaks, Czechs, Poles, Croats, Serbs — and, lastly, African Americans, who were consigned to the coke ovens, a circle of hell. Discrimination against blacks, Italians, and “hunkies” (considered a friendlier slur than “hun,” for all Slavic people) resulted in an elaborate web of segregation and tension. Hoerr’s analysis and the research work by John Bodnar help me understand the culture that persists in Ambridge – one of powerlessness against well-established families, businesses and entrenched political authority. As ethnic neighbors formed alliances to fight for better treatment, the labor movement finally became more inclusive and supplied an institution that could unify the immigrants in their struggle. But the unions took fifty years to mount a serious threat to business as usual. The violence that erupted on Duss Avenue during the 1933 steelworkers’ demonstration had been festering for a decades. Meanwhile, the dominant class of executives and foremen filled the seats on county and municipal commissions, expanding their power into political circles. As such, they supervised ethnic leaders in the mills, who, in exchange for favors, delivered blocs of voters from their neighborhoods. It was good old-fashioned ward politics, but in this case, the mill stood at the center. Patronage became a way of life. Great writing, Paul! It really brought me back to Ambridge for a few minutes (enough, I think, for now….). Thanks, Mike. It’s surprising, my immersion in this made me want more. Once you’ve recovered, please come back to this site for another dose. Great to hear from you. You’re a sweet man, Dad. Thank you. Keep this coming; it’s outstanding. We all know how short the American memory is and how facts become distorted. Thanks, Bill. Good to hear from you and have you along. Please stay tuned… subscribe for the weekly installments. Great story about American history and the importance of immigrants from all parts of Europe building a stronger and better United States. We need more with their character today. Reminds me of my grandparents. That’s precisely what I’m trying to put across here, Tom. Thanks much for your response. Fantastic writing about the town that I was raised in…graduated Ambridge High School in 1954 and left town soon after to attend college in Denver. I followed my “Elders’ Advice” by “getting as far away from here as possible.” Married my High School Sweetheart and moved on! No regrets! Many fond memories! Your writing brings back many of those memories-most are cherished! I look forward to reading all your blogs about Ambridge! It’s great to have you along, Eugene. Your own exit from Ambridge brings up an interesting point — many parents fell into one camp or the other: a) why would you want to leave? Your whole family is here. What could be more important? And there will always be work for you; or b) study hard, go to college and get as far from here as possible. But what I’m finding is consistent is the fondness of the memory — and it’s true of readers from Ohio and Michigan and Indiana who are seeing Ambridge as a familiar setting. Thank you for your thoughtful comments and I hope you enjoy the few remaining chapters. Lived in Ambridge and went to Ambridge schools in the 1940’s. My father worked at the H H Robertson Mill on 14th Street. 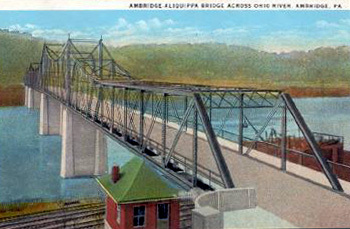 Left Ambridge in 1950. Thanks for this article, well written, enjoyed the pictures. Thanks for stopping by, Lillian, and leaving a note. Glad you enjoyed your visit. My Dad Al Huwar was also a draftmans for AB for over 30 years,and his father August was a machinist in the plant. I live in Iowa now, but love the old home town……..
Hey Paul. My dad worked as a draftsman at American Bridge – Jack Saylor. I think he worked with your dad. Thanks for writing this! Stumbled on this article today and reminded me of a vacation we took with my parents back in the early 80’s. We had two small children and my Dad made sure we took the route south that would take us across the New River Gorge Bridge. He was so proud because he worked at American Bridge as a bucker, sticker, welder and crane operator and probably many other jobs along the way. I never drive across that bridge that I don’t hear him say “the world’s longest steel single span arch bridge”. Thanks for the trip down memory lane. Thank you so much, this was a wonderful writing. My grandfather worked at American Bridge, I don’t know how many years; and my father worked there also; he retired Dec. 1980 with 40 years service. This article really brought back so many memories. I grew up just down river from Ambridge in the mid-60’s thru ’70’s. unlike most families, my dad was white-collar and we were WVa transplants so didn’t have family locally. It was very interesting reading about the birthing so to speak of the area. Thanks! Love your writing and research! We lived at 314 Maplewood Ave, a few blocks away from AB. Played baseball at the park near the AB office on Park Road. My father worked for 40 yrs at J&L. 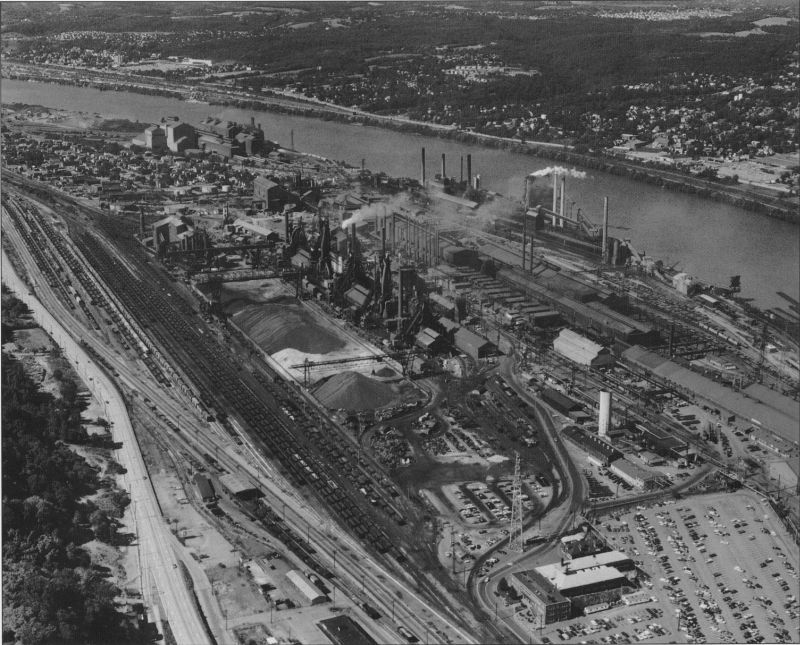 I worked summers at J&L, National Electric and Bethlehem Steel while in college. Thank you for all your efforts! I grew up at 143 Merchant Street (in the 1950’s) just up the block from the first street tenements. I remember how poor the people were. My dad worked at Spangs-Chaflant which later became Armco. I think there was a whistle at the end of the work day at American Bridge and then the men would come walking home. The article was very well written and I learned so much about the culture from it. Many of our neighbors on both Merchant Street and Maplewood Avenue were Greek. Thanks for offering your memories of the poorest part of town, Sandra. For the most part, though, what the First Ward lacked in resources they made up for with cohesion. Residents there looked out for each other. And yes, that sure was a Greek enclave — surrounding their church. Thank you for visiting the site. I hope you enjoy the rest of the stories and will come to hear me read sometime. If a reading comes up, I’ll let you know. Paul, I received the link to your blog from a family member and was delighted to see that you were the author. Many of my family members also worked in the mills. In fact, my uncle Vincent (Jim) DePace had a role in the strike in 1933. Keep writing, Paul. You have a gift for bringing all the memories back. Great to have you in attendance here, Nancy. It was a rare family that didn’t have someone working in the mills. I hope you enjoy the other stories and I look forward to seeing you again soon. If I can arrange an invitation to read in Pittsburgh, I’ll let you know. Reading these comments, makes me smile, I had an Audrey Hertnecky, little different spelling, graduate with me in 63. Most of my uncles and my father worked at American Bridge. My Uncle Bill DeBrucky was a draftsman there, Uncle’s Robert, Romeo, Arthur, Harry, and Geno all worked there. My grandfather worked there till he was fired for knocking out his boss after the foreman hit him with an ethnic slur. My parents graduated from Ambridge high as did all five of my siblings (I was class of 63). Father worked for Spangs, grandfather was a craneman for American Bridge. I worked summers at Armco and J&L. Also wrote a novel that takes place in Ambridge. Thanks for the wonderful great article. Nice memories. Good to have you along and thanks for the note, Walt. You wrote a novel set in Ambridge? Was it published? How can I find it? great story, I worked there between 1967 and 1971, I drove rivets and loved every minute of it. Great to hear from a riveter who loved his job, Keith. Fact is, many of the men and women who worked at AB report liking the work. Much of it depended upon your bosses, as usual. Thanks for the comment. I hope you’ll keep watching this space, and please feel free to leave more comments. Ain’t it the truth, Mr. Mihalick. Thank you for reading and writing your reaction. When home gets under your skin, the Ambridge has, it’s never really far away. I hope you’ll read more and let me hear from you again. Your article brought back many memories of growing up in Ambridge, first on Maplewood Ave between Sixth and Seventh Streets and then on Park Road near the corner of Sixth Street during the 1940s and 50s. My Grandfather, Harley Sairs, worked in the drafting department at the Bridge Company, as did my father, James Reese. My uncle Leonard Holsinger worked in the Accounting department until he died in June of 1959 and his daughters, Jean Holsinger Hayes and Alison Holsinger still live in Edgeworth. Oh, you must have had fine life during one of the town’s true heydays, Mrs. Mihalick. Through your account, it’s easy to see how the Bridge Company stood at the center of life in those days. I hope you will read more of these stories and I wish the very best for you, your husband, and your cousins in Edgeworth. Thank you for writing, and please do so again. Ambridge was and will always be my home sweet home! Paul, you have left me with tears in my eyes. The memories of the town, the people, and life, life universal, made my efforts possible. I’AM PROUD TO BE AN AMBRIDGE BOHUNK. General Alvin F. Mihalick Ph.D. DoD. retired. Was your Dad a teacher at AHS???? I’m sorry, did I refer to you as Mr. Mihalik in my last reply? I should have said General Mihalick. My apologies, sir. Why am I not surprised that you launched yourself from Ambridge and made a great success out of life. You should be a proud Bohunk! As the story says, my father spent his life working pretty much exclusively for AB. His brother, John, had a career as a teacher at AHS. I write about him later in (what I hope will be) the book. Reading your posts is like sitting around the table with a family gathering and hearing all of the stories from the family elders. I have been printing them and mailing them to my sister in Ambridge who doesn’t want a computer. Each post has been wonderful and never fails to stir my imagination and actually my pride in where my roots were located. Thank you, Joe, for your kind words. You should be proud to have come from such a vital and fascinating place. Although it looked like many other places up and down the rivers, Ambridge had a spirit and soul of its own. But then again, most people would say that about their hometowns, and I’m beginning to see readers from Detroit and Buffalo and other places feel the same way about their (fairly broken-down) towns. It was a special place over a few centuries, and it still is to many of us. Please send me you thought on the other stories, too. Thanks. I enjoyed your narrative on Ambridge immensely. You have a rare talent for getting the most out of relatively few words. Thank you. A question: I spent about a dozen years as a school mate of a cute little brunette named Joanne Hertneky. How are you two related? I will be shopping for your book. Bradley Bowen — what are your intentions!? Do you know how many men have asked me to disclose the whereabouts of — I believe it’s Joetta, not Joanne you’re looking for. She and her sister were some of my favorite cousins. Plus, yes, they were older and beautiful. I’ve lost touch with them but a quick search leads me to believe that Joetta’s last name is now Gardenier and she lives in Baltimore. Good luck finding her and say hello, or send her to this blog for me. Thanks for your kind words. I hope you will enjoy the other stories. My brother,Don Conte, sent this to me.I was born and raised in Ambridge,and actually was born in my grandmother’s house in the 600 block of Park Road.My family lived on park Road for 42 years.There were 6 kids in my family,and none of us live there any longer.My brother Walt Conte wrote to you a few months ago.I was fascinated by your article,and found that there are so many things that I never knew about Ambridge.Also,stirred up many memories.Before the highway ran through the park,my grandmother would take us to watch the old locomotive trains and look down at the American Bridge CompanyWhen I was growing up and for many years,it was so sooty and dirty from all the smoke,we could see the ash falling through the air.But the people there were incredible,friendly with close knit families and great neighbors.I graduated in 1954(Gene Sestile who wrote to you was in my class)We were all proud to be Bridgers.Saturday nights on Merchant Street were the best.Everyone shopped and visited or went to one of the 4 movie theaters on Merchant Street that showed all of the latest movies.Ambridge was a wonderful place to grow up,and there are lots of things that I miss.Thanks for the wonderful articles about my dear home town. October 25, 2013, enjoyed the Ambridge article and the part about American Bridge. My Aunt, Georgene (Hendrickson) Barto ran a crane in tandem, carrying LSTs around the plant while they were being built for WW II. 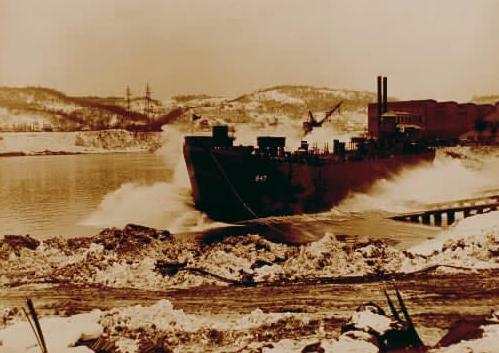 When an LST was moored in Pittsburg she went up to see it and the Times did an article about her and the LST. She told them she only helped build them but never had a chance to see what they looked like inside. She is 100 years old, lives at Elmcroft and loves to reminisce about Beaver Valley. Thank you, Guy, for the remembrance of your aunt, putting a face on these stories. Please give her my best wishes. Enjoyed the article. I grew up on First Street. My grandfather may have been the man the beam fell on in the story. A beam fell on him in September, 1922. My grandmother then took my mother and two uncles back to Romania. My mother brought me to First Street in1946. It was a great place to grow up! Good people that would always be ready to help when needed. I made some lasting frendships. There was a lasting bond among the people that lived there.People didn’t have much, but were willing to share what they had. Graduated from AHS in 1958. I’m sorry you lost your grandfather in such a horrible way, Eli. It’s possible he was the man my grandfather saw die. The timing is right. And I’m sure you did make some lasting friends growing up on First Street. For one of the towns poorest neighborhoods, it seems to have given birth to the most lifelong relationships. Thank you for sending this note, and I hope you enjoy the other chapters. Bob Syrko, my brother in law, sent me this blog and I just love it. Mike Syrko and I, Coralee Smith both graduated in 1962 from Ambridge. Married in 63. Mike born on 1st street. Mostly remembers being hit by a car there. How do I go back and see posts before March 2011. Also interrested in “ransacked Harmony Society”. I am a volunteer at Old Economy Village and would love to hear any information on that time. Great research Paul! As they say you never stop learning….. Growing up at 351 Maplewood.with my sisters Donna Lee, Betsy, and Amy, I.
found many memories floating to my head while perusing your blog and/or excerpts from Rust Belt Boy.